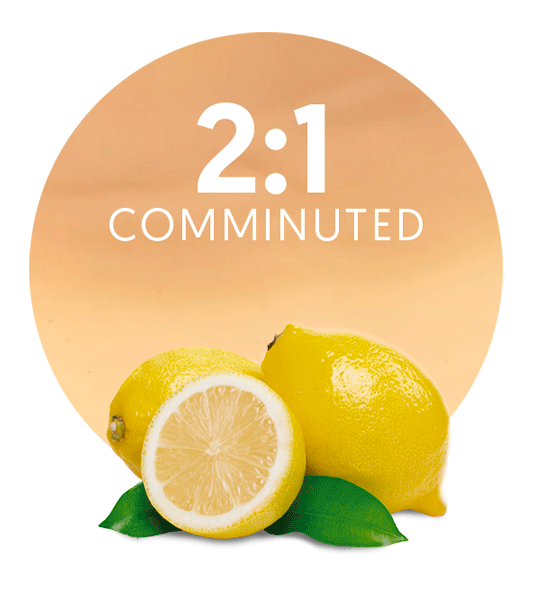 Lemon Comminuted 1:1 is elaborated with lemons cultivated near the Mediterranean Sea. Thus, they benefit of the best possible weather conditions for this purpose: warm during the day and cold at night. Lemon Comminuted 1:1 is prepared with lemons from the different Spanish varieties of Citrus Limón. As you know, the lemons from Murcia, a South-Eastern Spanish region, are very famous because of their freshness and rich properties. We obtain our Lemon Comminuted 1:1 from these varieties in order to obtain a high-quality product, ideal to elaborate any kind of beverage or food products. Lemon Comminuted 1:1 is made by concentrating the flabedo, albedo and endocarp parts of the lemon once. However, we also supply lemon comminuted 2:1, which is concentrated twice; lemon comminuted 3:1, which is concentrated three times; and lemon comminuted 4:1, which is four times concentrated. The type of lemon comminuted, also known as lemon puree, needed depends on the final use of the product and the client’s necessities. Lemons are sent to manufacturing facilities with modern technologies for its processing and packing, always maintaining the whole properties of the fruit and leaving it ready for its supply worldwide. Lemon Concentrate manages to reduce the time between the collection and the processing due to the short distance between the croplands where the fruit is harvested, and the manufacturing plants where it is treated and processed. The result is a high-quality product with intense freshness and flavor. Apart from the products mentioned above, some other Lemon Concentrate’s key products worth mentioning are pomegranate cloudy, pure orange puree, orange cloudy debittered, orange cloudy regular, pure lemon puree, lemon cloudy debittered, lemon cloudy regular, lemon compound, lemon compound 40 Brix grades, lemon fruit concentrate, orange comminuted 1:1, orange comminuted 2:1, orange comminuted 3:1, and orange comminuted 4:1.